This article is about Samus in her Zero Suit. For Samus in her Power Suit, see Samus Aran. Zero Suit Samus is an alternate form of Samus Aran without her Power Suit, wearing a skintight jumpsuit. In this form, Samus's main weapon is the Paralyzer, a small pistol-like weapon that is only capable of stunning enemies. Although Samus has appeared without her armor in previous Metroid games in a small capacity, the first appearance of Samus in her "Zero Suit" was in Metroid: Zero Mission, which consolidated Samus's appearance and abilities outside the Power Suit. While Zero Suit Samus is a very vulnerable and more stealth-based form in her home series, the Super Smash Bros. series enhances her abilities by giving her an extensive, speedy hand-to-hand moveset similar to Sheik, as well as additional weaponry in the form of a "Plasma Whip" mode for her Paralyzer and, in Super Smash Bros. for Nintendo 3DS / Wii U and Super Smash Bros. Ultimate, rocket-powered "Jet Boots" that resemble high-heeled stilettos. When Samus finishes her Final Smash, the Zero Laser, the force of the beam is so strong it causes the Power Suit to fall off, allowing Zero Suit Samus to be playable. Zero Suit Samus is more swift and agile than her armored form, though lighter and easier to KO. In this state, Samus fights using a gun that can stun opponents and also turn into an energy whip. Zero Suit Samus's standard special move is the Paralyzer, in which she fires a blast from the gun that can stun opponents. Her side special is Plasma Whip, in which she fires a whip to the side that deals more damage at the tip. Her up special is Plasma Wire, in which she fires the whip directly up. Finally, her down special is Flip Jump, in which she does a jump that can be followed up with a kick. Similar to Samus, Zero Suit Samus's grab also uses the Paralyzer's whip, which gives her an extended grab; this and her up and side specials can all be used as tether recoveries. At the character selection screen, when players select Samus, they can start the battle as Zero Suit Samus by holding the following buttons when proceeding to the stage selection screen. Players can also turn into Zero Suit Samus from normal Samus mid-battle by executing her up, down, and up taunts in rapid succession. By using Zero Suit Samus's Final Smash, Power Suit Samus, she transforms back into her armored form. Samus first appears in the Subspace Emissary in her Zero Suit, infiltrating the Research Facility to retrieve her stolen Power Suit. Along the way, she finds Pikachu trapped in a power generator and frees it. Eventually, Samus tracks her Power Suit down, but was stopped by evil copies of it. She defeats them and retrieves her suit. She, along with Pikachu, spends most of the Subspace Emissary in either the The Research Facility or The Subspace Bomb Factory. When Samus is selected on the World Map, she can still be turned into Zero Suit Samus by pressing the grab button. Zero Suit Samus reappears in Super Smash Bros. for Nintendo 3DS and Super Smash Bros. for Wii U as an independent character, after the removal of in-battle transformation moves. Her overall appearance has been somewhat altered, still using her general design from Metroid: Zero Mission while also taking elements from her appearance in Metroid: Other M. As a result of being a separate character, she has a different Final Smash, Gunship. For her general moveset, she adopts different footwear, her boots now featuring a pair of jet boosters on the heels, which enables her kicking moves to be more powerful and have an electricity effect. These jet boots have also replaced her up special move, Plasma Wire, with Boost Kick, which uses the jet heels to boost herself into the air while kicking. Zero Suit Samus receives significant improvements: her mobility and attack speed are faster, many of her attacks deal more knockback, and her tilt attacks and forward smash deal more damage. However, her overall damage output is lowered. Zero Suit Samus also has two additional alternate costumes, based upon her appearances during the endings for Metroid: Zero Mission and Metroid Fusion. Zero Suit Samus returns as an unlockable playable character in Super Smash Bros. Ultimate, retaining many of her moves from the previous installment, as well as continuing to be considered a separate fighter from Samus. For her Final Smash, instead of attacking fighters directly from her Gunship, she rides on top of it while wearing the Power Suit and fires a laser very similar to Samus's Zero Laser from the background, which can be aimed with the on-screen reticle. Zero Suit Samus benefits from universal changes: her mobility is even faster, her short hop timing is reduced, the landing lag in her aerials are reduced, the reintroduction of directional air dodging aids her recovery, and the abilities to use any ground attack out of a run and her aerials on ladders come with merits. However, her damage output has been further decreased, while her weight has also been reduced. The Paralyzer is Zero Suit Samus's main weapon first appearing in Metroid: Zero Mission, only capable of stunning enemies, and the name of Zero Suit Samus's standard special move. When used, Samus fires a blast from the gun that can stun opponents. The blast can be charged by holding down the special button, which increases the distance that the blast can travel and the duration of the stun effect. In Super Smash Bros. for Nintendo 3DS / Wii U, the Paralyzer has two custom variants. The first is Blast Shot, which fires faster and has a greater range, but does not stun and deals less damage. The second is Electromagnetic Net (named Spreading Shot in the PAL version), which fires a larger blast that covers a greater range and explodes, dealing continuous damage, but it does not travel as far. Plasma Whip is Zero Suit Samus's side special move. 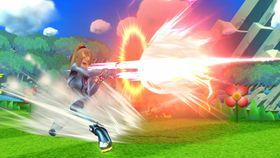 When used, Samus shoots an energy whip from her Paralyzer forward that damages opponents nearby, the tip dealing the most damage. The body also pushes opponents toward the tip while the move is being used. The move can also be used as a tether recovery, having greater horizontal range but less vertical range than the Plasma Wire. 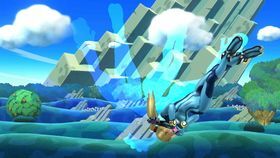 In Super Smash Bros. for Nintendo 3DS / Wii U, the Plasma Whip's first custom variant is Plasma Dash, which causes Samus to dash forward into enemies with her gun held out, damaging them and pushing them along; since the move no longer uses the whip, however, it cannot be used to grab edges. The second is Whip Lash, which can only hit at the end of the whip, and knocks opponents toward Zero Suit Samus when they are hit. 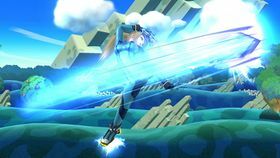 Plasma Wire is Zero Suit Samus's up special move in Super Smash Bros. Brawl. Samus fires her Paralyzer's whip directly up, damaging opponents above her multiple times, knocking them up toward the tip which forces them back toward the ground. The move also acts as a tether recovery, automatically grabbing ledges. 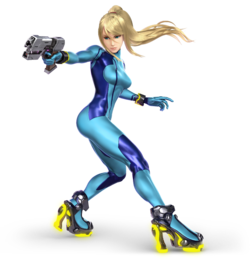 Boost Kick is Zero Suit Samus's up special move in Super Smash Bros. for Nintendo 3DS / Wii U and Super Smash Bros. 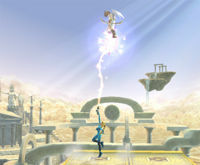 Ultimate, replacing Plasma Wire from Super Smash Bros. Brawl. When it is used, Samus kick up into the air, striking opponents that she hits multiple times before delivering a final more powerful kick that knocks them back. In Super Smash Bros. for Nintendo 3DS / Wii U, the Boost Kick's first custom variant is Impact Kick, which only deals one more powerful hit with the initial kick, though the second kick is also more powerful. The second variant is Lateral Kick, which kicks up at a lower height, but boosts forward on the second kick. Flip Jump is Zero Suit Samus's down special move. 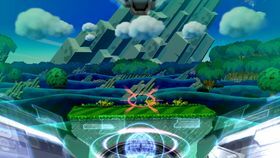 When used, Samus leaps up into the air at an arc in the direction she is facing and lands facing the opposite direction. If Samus hits a wall during the jump in Super Smash Bros. Brawl, she automatically leaps off of it, and can do up to four wall jumps in this way; in Super Smash Bros. for Nintendo 3DS / Wii U, the player must manually press the jump button, but can still only do up to four wall jumps. Pressing a button during the attack causes Samus to kick downward at an angle that acts as a meteor smash when it hits anyone in the air when initially used. The player can choose the direction of the kick with the control stick. 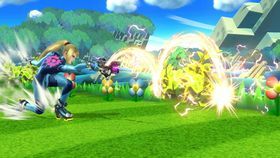 In Super Smash Bros. for Nintendo 3DS / Wii U, the move automatically hits opponents when Samus comes into contact with them without having to use the kick. In addition, the move buries opponents when hit on the ground, and is a meteor smash when hit in the air. The player can also adjust Samus's angle mid-jump with the control stick. In Super Smash Bros. for Nintendo 3DS / Wii U, the Flip Jump's first custom variant is Shooting Star Flip Kick, which does not deal damage during the jump, and the kick is replaced with a falling kick that travels horizontally. The second is Low Flip, which does not jump as high but travels farther. Power Suit Samus is Zero Suit Samus's Final Smash in Super Smash Bros. Brawl. Upon activating her Final Smash, Zero Suit Samus begins spinning and her armor begins forming around her, turning her back into her armored form after the transformation. During the transformation, electrical sparks are emitted from the suit, repeatedly damaging and launching nearby fighters. Despite the move being called "Power Suit Samus," Samus actually equips her Varia Suit from Metroid Prime. The Power Suit is a different suit of armor that Samus does not wear in the Super Smash Bros. series. Gunship is Zero Suit Samus's Final Smash in Super Smash Bros. for Nintendo 3DS / Wii U, replacing Power Suit Samus from Super Smash Bros. Brawl. 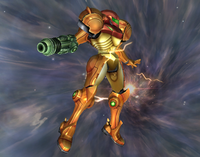 When used, Samus calls her Gunship and leaps inside; from there, the player can blast opponents with twin laser cannons, aiming the targeting reticle with the control stick, similar to Snake's Grenade Launcher in Super Smash Bros. Brawl. After some time has passed or five shots have been fired, the move automatically ends and Zero Suit Samus drops back down to the battlefield. Zero Suit Samus only appears in the Metroid Big Name Game in WarioWare: D.I.Y. There is a small chance that Samus appears in her Zero Suit after the player defeats the Metroids on-screen, rather than her in her Power Suit. Samus can also appear without her armor at random in the Metroid microgame in the earlier WarioWare: Touched!, though she uses her sprite from the original Metroid rather wearing than the Zero Suit. Zero Suit Samus appears as a Costume Mario costume in Super Mario Maker. Her sound effects are taken from Metroid: Zero Mission; the theme that plays when the game is loaded plays when the Mystery Mushroom is collected, the theme that plays when an item is obtained plays when the level is completed, and the death sound is played when the player loses a life with the costume on. Online: "When Samus destroys her Power Suit, she’s left with the Zero Suit. What she’s lost in power and weaponry, she makes up for in speed! Once she turns that Paralyzer in her hand into a whip, she has quite a long reach as well! Not exactly the straightforward fight you thought it was, huh?" Instruction booklet: "Samus in her unarmored form. Her physical abilities far outclass standard humans." Wii Super Smash Bros. Brawl Samus Aran without her mighty Power Suit. In this condition, she does not have the firepower she's famed for but is in full possession of the agility and athleticism she gained through her childhood training with the Chozo. Without the armor, she's also much, much faster. The weapon she carries is a self-protection device known as a Paralyzer that stops enemies cold. Snake: Mei Ling, Samus took her clothes off! Mei Ling: That's just her in the Zero Suit, Snake. Snake: Without that bulky Power Suit, she's gotten a lot more agile... You know, I bet if I took off all this heavy gear, I could catch her. Mei Ling: Um, yeah, you wish. Even without the Power Suit, all that training she did with the Chozo has made her a super athlete. I don't think a normal human could ever keep up. Just look at her. Wii Metroid: Other M (08/2010) NA: Samus is far from helpless when her Power Suit is deactivated. Sure, she loses a lot of the moves and weapons she had access to before, but her Jet Boots pick up the slack! She also has the Paralyzer, a versatile weapon that can shock her rivals or change into a Plasma Whip to grab edges and enemies. PAL: Without her Power Suit, Samus Aran may not have her usual strength, specials moves or over-powered arm cannon, but her Jet Boots definitely kick things up a notch in their own way. The Paralyzer, her gun, does just what you'd expect it to, but it can also turn into a whip for attacking and grabbing onto edges while falling. Wii Metroid: Other M (08/2010) NA: Zero Suit Samus's up special Boost Kick involves a series of fast kicks that end with a swift, sideways-launching one. A perfectly executed attack will hit eight times! Her down special Flip Jump can bury a grounded fighter in the dirt. She can kick midflip by pressing the special button. PAL: Zero Suit Samus's Boost Kick up special finishes with a swift sideways kick. If you start the move close to an opponent, you can hit them up to eight times and launch them sideways! Her main down special, Flip Jump, buries opponents if you land on them at the end of it. Alternatively, press the button again mid-flip for a drop kick. N/A NA Samus's spaceship carries her through space and serves as her base of operations during her mission. Zero Suit Samus will call down and board her Gunship with her Final Smash. Once she's in the pilot's seat, she has a short time to unleash up to five powerful shots from the ship's weapons. Foes aren't safe even hiding off-screen! Red indicate exclusive to the 3DS version. Blue indicate exclusive to the Wii U version. Palutena: That's Zero Suit Samus. She usually wears heavy armor, but not in this incarnation. Even so, she's still pretty powerful. Pit: She has some pretty hurty-looking equipment. Getting kicked by those Jet Boots has gotta sting! Palutena: You have a good deal of "hurty-looking equipment" yourself, Pit. Pit: Yeah, and can you believe that there are some fighters that battle empty handed? Crazy! Palutena: It's all about discipline, not weaponry. Don't worry, though. When we get home, I'll enroll you in Palutena's Boot Camp. That'll fix you right up. Pit: Or I can just keep my weapons. Yeah, let's do that. Palutena: Anyway, Zero Suit Samus is a difficult target to hit. Keep your attack sure and ready. Samus is far from helpless when her Power Suit is deactivated. With her Zero Suit, she doesn't have the firepower she's famed for but is in full possession of the agility and athleticism she gained through her childhood training with the Chozo. Without the armor, she's also much, much faster. The weapon she carries is a self-protection device known as a Paralyzer that stops enemies cold. All quotations are from Super Smash Bros. Brawl, and are reused in subsequent Super Smash Bros. games. 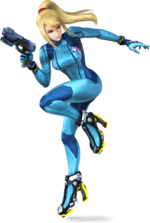 The Zero Suit is never actually referred to as such in any Metroid title released prior to Super Smash Bros. Brawl. This page was last edited on March 16, 2019, at 14:43.